This is a guest post by the lovely Chantal about her experience and must visit places in Ethiopia. If you haven’t read her post before about the Muslim-Friendly options in Trinidad and Tobago read it below. Long before Yathrib became Medina, Muslim immigrants found safety in a land known as al-Habesha. Ruled by a “might and just ruler”, the Prophet Muhammad (PBUH) advised his early followers to find sanctuary in this Christian land when persecution by the tribe of Quraish bore heavily upon them. One night, about a dozen immigrants heeded his advice and migrated by boat to eventually settle in the hills of Northern Ethiopia. This significant event in Islamic history is often overlooked in most of the country’s travel tours which instead highlight monasteries, rock-hewn churches, and medieval castles. 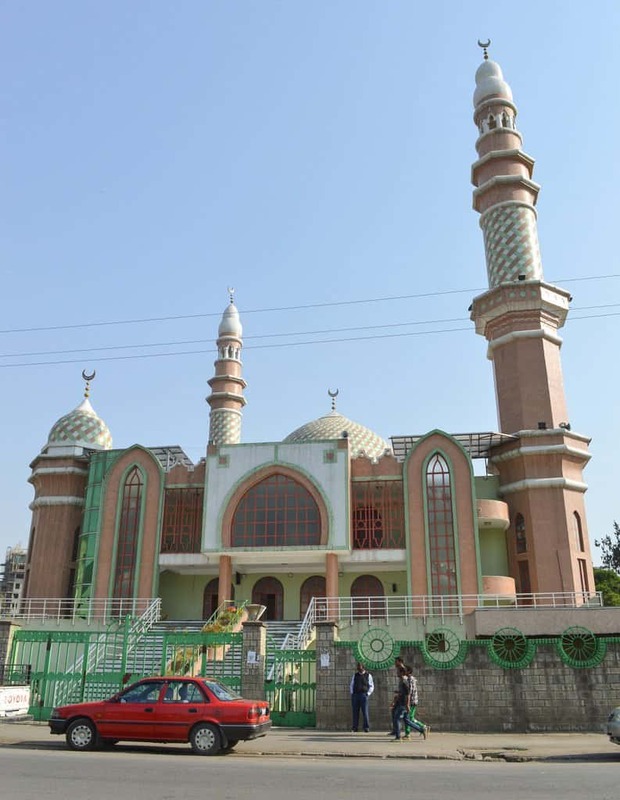 However, for the Muslim traveler, there are several sights in Ethiopia that should be of particular interest and here’s why. To visit the land that boasts “13 Months of Sunshine”, start in Addis Ababa, the country’s capital for an introduction to Ethiopian history, culture, and cuisine. The National Museum displays artifacts and images that show the distinct historical periods and ethnic groups of the country. The Ethnological Museum at Addis Ababa University goes further to illustrate the dress and customs of Ethiopia’s diverse population. The city’s prominent mosque, Al Anouar Mosque, can be found near Merkato, Africa’s largest open-air market. At Itegue Taitu in Piazza, the nation’s very first hotel, you can enjoy a delicious daily lunch buffet that is completely vegetarian. This UNESCO world heritage site was once the capital of an Islamic sultanate. 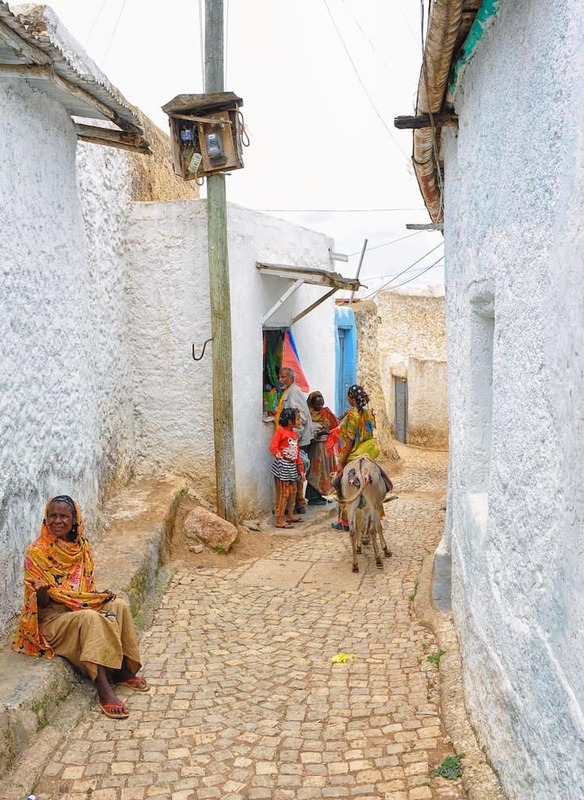 It’s easy to get lost in Jugol, the heart of Harar, but not for long since the maze-like walled city is only one square kilometer. 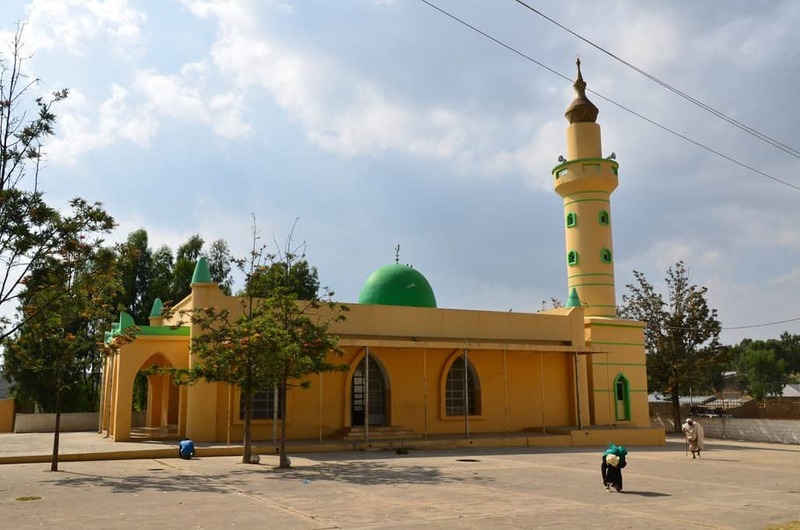 In spite of its size, more than 100 mosques are scattered about with a good handful of sights to see like the Sherif Harar City Museum, the Rimbaud Museum, and the mausoleum of Amir Nur, the esteemed leader of Harar who is responsible for the wall that surrounds the city. Be sure to visit the Rewda Cultural Guesthouse to see a traditional Harari home and the only accommodation within the walled city. Named after the ruler or negus of Ethiopia, Negash is a small town in the far north of Ethiopia, near the city of Mekele. Beyond a spacious market, one can easily see the nation’s very first mosque towering over the merchants. According to Islamic sources, the former ruler who provided sanctuary to the early Muslim migrants, Ashama ibn Abjar, responded positively to the Prophet Muhammad’s invitation to Islam and the Salaatu’l Janaza ‘ala al-Gha’ibin (Funeral Prayer in absentia) was performed on his behalf by the Prophet Muhammad (PBUH). Negash was the very first Muslim settlement and is now frequented by Muslims from all over the world. A beautiful mosque and mausoleum stand as a reminder of Islam’s first refuge. Ethiopia has a long history with buna, also known as the coffee bean. When hosting guests, a traditional ceremony that begins with roasting green coffee beans, then pounding and brewing them is performed in a unique way that shows reverence for coffee and the communal act of sharing it. 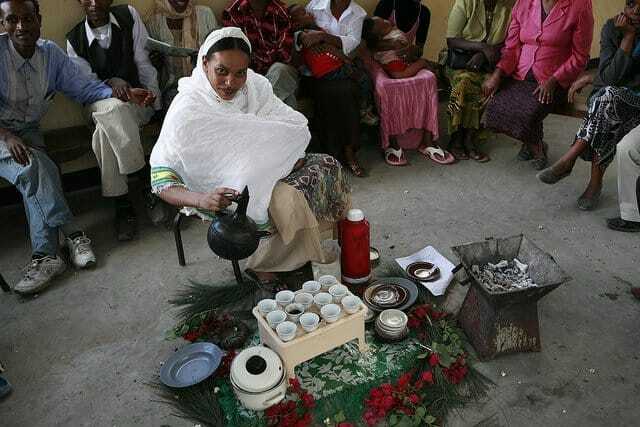 Officiated by a woman in beautifully woven Ethiopian garb, participants are invited to sit on colorful woven chairs and receive their coffee, often served with a light snack like popcorn, peanuts, or a special celebratory bread called himbasha. 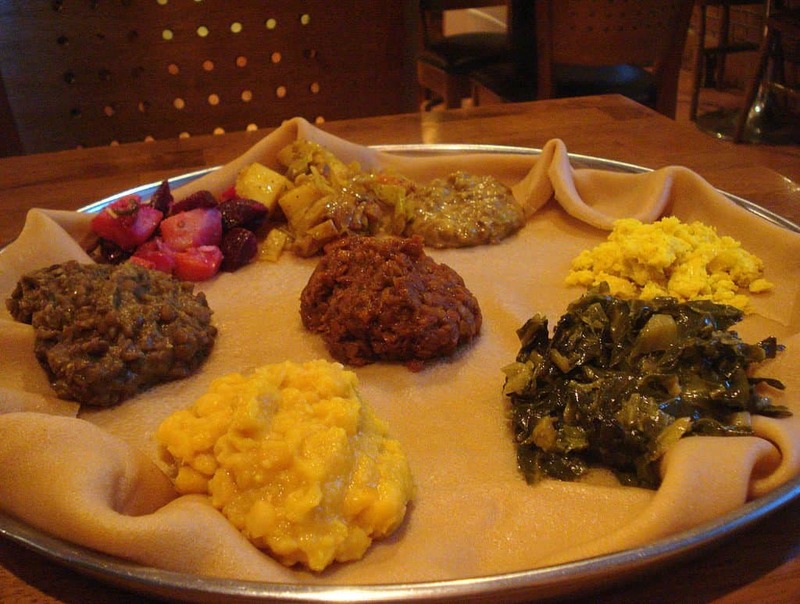 Much like the Prophetic practice, Ethiopian food is generally eaten by the right hand. 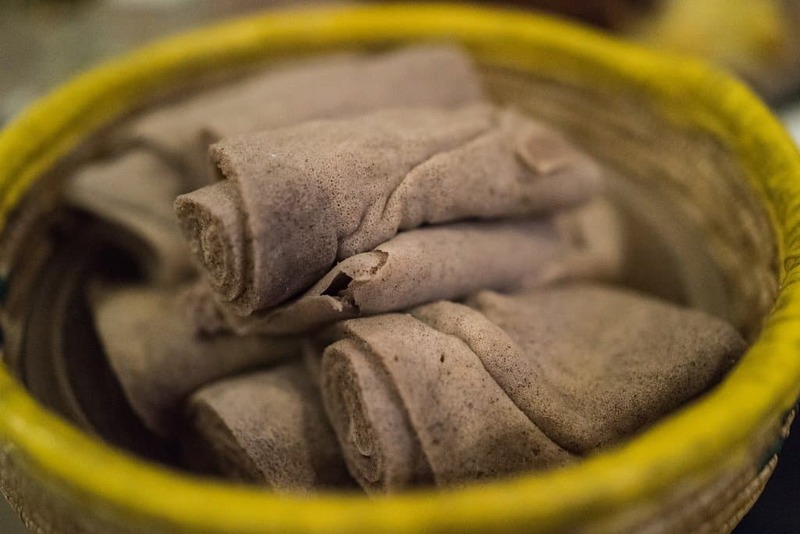 A sponge-like, fermented flatbread made from teff called injera is used to grab morsels of food, but instead of feeding yourself, you might be fed by someone else. Placing food in the month of another is seen as a demonstrative gesture of love and friendship. 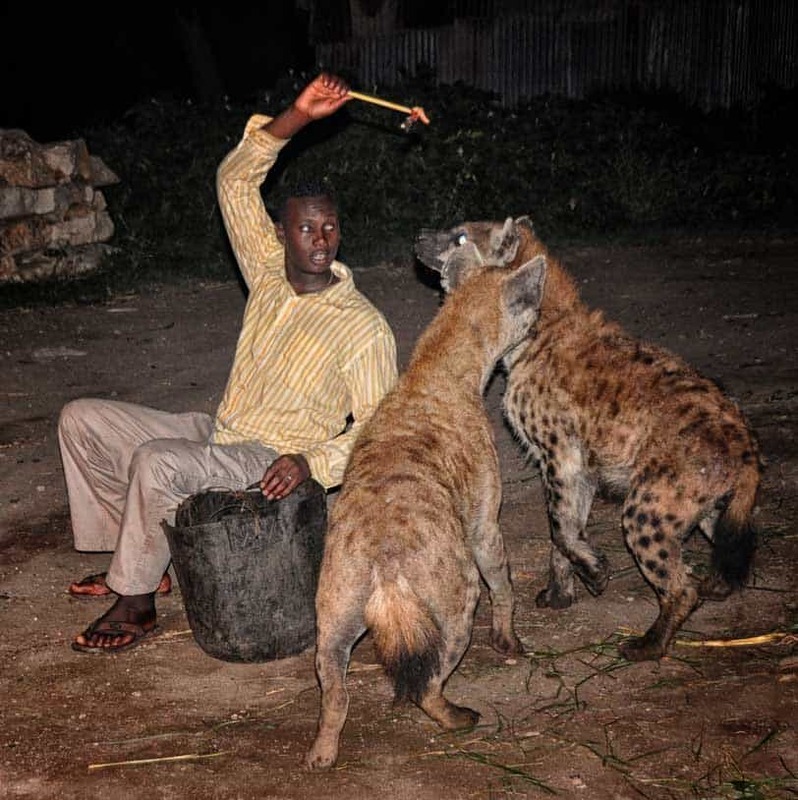 In addition to feeding people, hyenas are fed on a nightly basis in Harar. Some say that this tradition was started by farmers who wanted to protect their livestock from being devoured. To this day, a handful of “hyena men” call the individual animals by name and proceed to feed them handfuls of raw meat. To add to the touristic appeal, the meat is held above the heads of volunteers or held in their mouths by short sticks. This custom continues to this day and is probably one of the only times you’ll be able to safely see a hyena up close. In the Ethiopian Orthodox Christian tradition, days of fasting are generally observed by not eating animal products. On the weekly fasts of Wednesdays and Fridays and seasonal holy days of fasting, delicious platters filled with fresh, seasonal veggies, spicy lentil stews, and injera are easy to find. Made from ground pea flour and berbere red pepper spices, this common stew is cheap, filling and delicious. Paired with injera, it’s a simple yet tasty meal that’s easy to say and easy to find on the road. This fruit smoothie is made of seasonal fruits like avocado, guava, and papaya layered in a glass and served chilled. You have the option of enjoying each layer one at a time or stirring it all together.